WOW houses a wide variety of disciplines, from classical music to modern dance and from painting to fashion design. With its programme, WOW acts as a platform for recently graduated talent and helps you make the transition from school to your own professional practice. 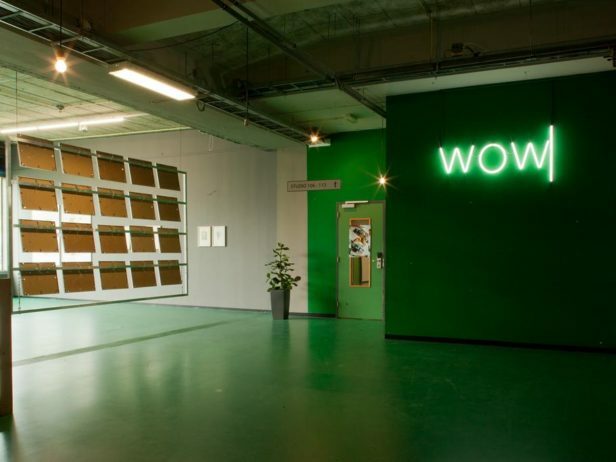 WOW offers an inspiring environment where you can live, work, meet and exchange ideas with visitors and other artists. You are invited to add to WOW’s creative and dynamic atmosphere. Fifty studios for Artists in Residence are situated on the first and second floors of WOW’s building, a former polytechnic in Amsterdam-West. They vary in size from 24m2 to 36m2. With a height of 3.80m the studios can be used as a combined living and work space. There are centrally located shared kitchens and bathrooms. Artists who have recently graduated or are about to graduate from an arts degree may apply for a temporary residency with a maximum duration of two years. Artists from all over the world are welcome. WOW’s selection process involves you sending us an application pack, including CV, portfolio, letter of recommendation and a questionnaire. If you are interested in a residency or have questions about it, please email wowamsterdamstudios@gmail.com. In order to be eligible for a studio, you must meet the conditions imposed by the CAWA, the Amsterdam Committee for Studios and Studio Housing. Read more about ateliers and the policy in Amsterdam here and after that follow this link and click ‘registration’ (top right on this page). After you have registered (25 euro for a year) you’re able to fill in a form.